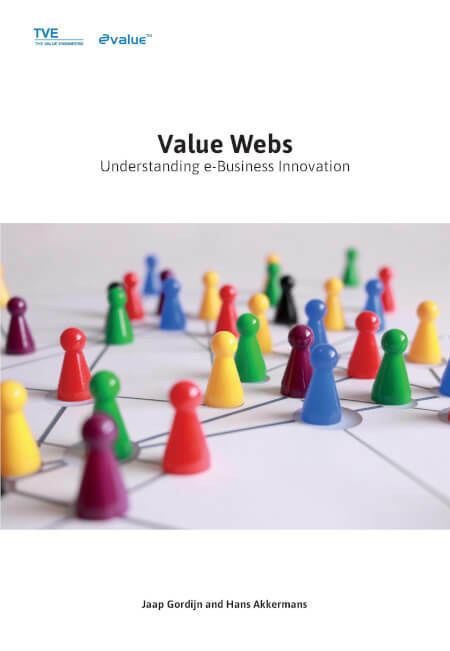 Value webs are networks of enterprises and end users who jointly produce things of economic value. Well known examples are Spotify and Netflix but Amazon appears also to be a network once you open it up. Value webs use innovative technology to offer valuable propositions to their customers. Value webs are, due to their complexity, difficult to understand. We present the e3value methodology to design, analyze and evaluate these value webs. Being a graphical approach, e3value can easily be understood by the management, business developers, and marketeers, but also rings a bell at IT people, hence e3value simplifies communication between business and IT. The e3value method was used successfully in the music industry, electricity supply, banking, news, telecommunication, and Internet service provisioning. Uitgeverij : The Value Engineers B.V.